Check HERE for the MATCH SCHEDULE! Practice: Our first practice is Monday, August 27th at 3:30pm. Practice will be held every Monday and Thursday from 3:30-5:00pm at the West Feliciana Sports Park. We are excited to announce that Ojo Thompson (a long-time Baton Rouge pro who also played for Southern in college) will be working with the kids on Thursdays. It is very important that you have your child at each practice. You will have to provide your own transportation from school to practice and/or arrange your own carpool. 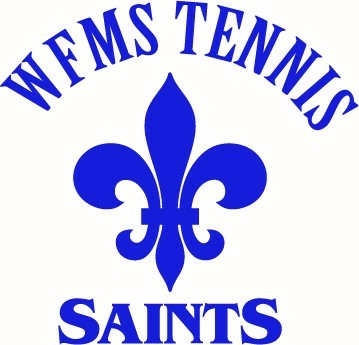 Forms: Each child will have to turn in the following: tennis registration form, parent permission form, LHSAA Medical History Evaluation form (physical) and a $30 fee (scholarships available). Your child cannot practice or play until I receive a physical. Uniforms: Your fee will cover your uniform shirt and other team expenses. You will be responsible for purchasing your own white tennis skirt/shorts and a racquet. All shorts must have pockets! If the skirt has the biking shorts underneath, it does not need pockets as you can hold a ball under the biking shorts. Bring to Practice: Each practice you will need to wear shorts or a skirt that can hold a tennis ball and appropriate court tennis shoes. You will also need to bring a racquet and a water bottle to each practice. Season Play: Competitive Play will consist of matches scheduled with other Baton Rouge middle schools. Match play will start in late September and will be once a week after school. Most matches will be on Wednesday afternoons or Saturday mornings. The exact date/time/location is TBD, however some matches will be played in St. Francisville and some will be played in Baton Rouge. We will provide transportation to away matches. Actual match schedule will be released at a later date. Players who play in matches will depend on coaches’ assessments of skill level as well as player’s commitment to academics, team practices and team rules. Keep in mind that if your child had 2 F’s on their last 9 weeks report card from last year, they are ineligible to practice or play. Questions: Please email missy@relocationcenter.com with any questions or concerns.